Some BC citizens are ramping up a campaign to get rid of the mandatory helmet law in British Columbia. Next year Vancouver will be launching a bikesharing system and this would be a good time to either get rid of the law or exempt bike-sharers. One of the only poorly performing bikesharing systems happens to be in mandatory-helmet haven Melbourne, Australia. The anti-mandatory activists in BC may be making a very good point as economist Charles Komanoff explained on Streetsblog recently. Mandatory helmet laws are unlikely to make cycling any safer and could actually make things worse by turning people off from cycling (by as much as 20 to 40% in Australian states and cities!). The head protection that helmets give are then outweighed by the poorer health of those who decide not to cycle and a worse 'safety-in-numbers' effect for those still cycling. They ignore the possibility that some non-helmet wearers will cycle less or will refrain from taking up cycling in the first place rather than use a helmet or risk being cited for riding bareheaded. They ignore safety-in-numbers, or, in this case, its inverse, by which having fewer cyclists on the road tends to raise per-cyclist crash rates with motor vehicles, as cyclists’ diminished presence on the road leads drivers to treat them as aberrations rather than as part of traffic. They overstate helmets’ protective value in reducing injury severity in the event of crashes. 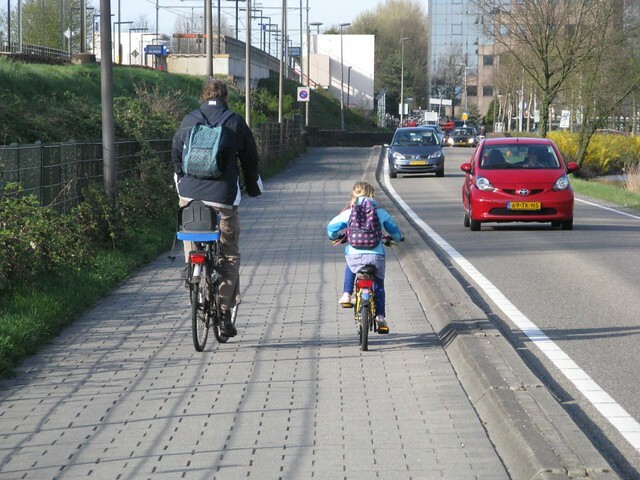 In the following two photos it's actually the father and daughter without helmets on Dutch separated lanes, and not the woman with the helmet and safety vest in the middle of Brussels traffic who are likely to be safer. Infrastructure and behavioural changes (such as in the Netherlands) have had a bigger impact on safety for cyclists then mandatory helmet legislation (such as in Australia). 7 years ago ago by IBikeTO. Helmet legislation certainly has the intended effect of increasing helmet usage. But as Komanoff shows in his chart, it can be easily offset by the decrease in the safety-in-numbers effect. Part of the confusion in all this lies in the fact that proponents have assumed what is true in case-control studies is also true across a society. Case-control studies have suggested that cyclists who choose to wear helmets usually have fewer head injuries than non-wearers. The same is not true for a society where helmets have been made mandatory. Before and after data show enforced helmet laws discourage cycling but produce no obvious response in reducing the percentage of head injuries. Dr. Dorothy Robinson looked at all jurisdictions that had introduced legislation and increased use of helmets by at least 40 percentage points within a few months: New Zealand, Nova Scotia (Canada), and the Australian states of Victoria, New South Wales, South Australia, and Western Australia. When looking at head injuries he found that there was no clear evidence that the reduction in head injuries can be attributed to helmet laws. In all cases head injuries were dropping anyway. Robinson also found that in Australia cycling rates were increasing before helmet laws put the brakes to it. The reasons helmet laws aren't working may be partly due to risk compensation where people feel that they can take greater risks when wearing a helmet; they might be wearing the helmet incorrectly. Some of the researchers also made incorrect adjustment for confounding variables in case-control studies where they misjudged how much of the effect was due to helmets. Helmets also aren’t very effective in reducing injury damage to cyclists who are struck by cars, one of the main reasons to wear one in the first place. “All scientific studies find that, even using conservative, understated estimates of the health benefits of cycling, they far exceed any traffic risk,” explains Pucher. The exact ratio varies from city to city and from country to country, but the health benefits of cycling are at least five times higher than the traffic risks, and in some countries, such as the Netherlands and Denmark, the ratio is almost twenty-to-one. So here's to having the choice of wearing a helmet or not. You can reduce the risk of a head injury for yourself by choosing to wear a helmet (though helmets are less effective when you're involved in a collision with a car). However let's not turn away people from a healthier lifestyle just because they don't want to wear a helmet. The risk of bad health is much higher for those who are sedentary than for those who cycle, helmet or no helmet. The more cyclists, the less the need for helmets. The more cars "sharing" the road with cyclists, the more likely there will be incidents. In Copenhagen, Denmark, they have a lot, lot more cyclists and zero deaths, and almost everyone rides without a helmet. I am new to Toronto but I thought that Bicycle helmets were the Law in Toronto. If it isn't the law here that explains why I have seen a few people not wearing them. Having survived a car knocking me to the road at great speed, head first into the pavement, I know how a helmet can save a brain and thankful I was wearing mine that day. While at the hospital for XRays,I was asked several times by various departments if I had been wearing a helmet when hit by the car. There's additional value too in reducing brain injury in a society that supports public health care. Talk to the doctors about the brain-dead and how many are due to folks not wearing head safety...and the cost involved. We are a long way off in both attitude and proper infrastructure compared to the more advanced cycling towns. I don't want to get into an argument about the pros and cons of helmets - I only suggest that until we have a respectful vehicle/bike culture along with safer bike lanes, helmets obviously make sense to me. I am glad a helmet made a difference for you Don. The main point here is not whether a helmet makes a difference. It does at least in certain kinds of crashes and collisions. Less so in others. But the main point is about forcing people to wear a helmet every time they get on a bike. From studies in Australia they saw a 20 to 40% drop in the amount of cycling. It may seem that you're safer by sitting on your couch but in reality you will have much better health by cycling, even without a helmet. So I encourage you to wear a helmet (heck you should even wear a helmet when driving - the only head injury I have had was while driving a car). But I am not going to try to force people to wear one because that would just backfire. That article's ridiculous. If someone does not want to take up cycling because they'll have to wear a helmet, everyone is safer. Let that individual take up running or spinning indoors to get fit. Toronto ain't Denmark, only a fool would ride in this city without a helmet. We don't have separated bike lines, but we DO have entitled motorists and cab drivers who resent sharing the road with unmotorized 2 wheeled vehicles. If there's a stupid law that needs to be changed it's the one about having a bell on your bike. A pedestrian hearing a bell has very little idea where the sound is coming from or what it signifies, A driver in a car won't even hear it, and most of the time the speed differential between cyclists renders the sound pointless. Matt: a healthier society is one that uses walking, biking, skateboarding, rollerblading, etc for everyday activities, not just for entertainment. People should bike to work, school and the grocery store more often. So you're suggestion that the should take up indoor spinning or running is insulting and dismissive. It will also do nothing to create a healthier society. Matt: One person not cycling due to such a rule might be insignificant, but the aggregate effect is what makes the difference. The article is only ridiculous if you believe that statistics and empirical research are also ridiculous. Your problem is that you're looking at safety in a narrow way. If you want to eliminate crashes and injuries just take all cars, bikes and pedestrians off the road. Instead the argument I outlined above is that mandatory helmets is bad public health policy and that it will make conditions for the cyclists who remain on the road even if they are wearing helmets. Getting more people to bike is good for our safety. Giving them reasons to stop is bad for our safety and bad for their health. Pedestrians should wear helmets to protect their heads from idiot drivers of all kinds, bike or auto. Good points made by the anti-manditory group. Beyond the ridership argument, the facts also support wearing a helmet when travelling by car, and while in the shower; the Danish Safety Council has recently sought to have people wear a helmet when going out for a walk. Limited service area and no cycling infrastructure. Sound familiar? I fear for Toronto's Bixi program. So far the program lives and breathes which is a testament to the tenacity of the cycling community in Toronto. Shame there aren't awards for most tenacious cycling city - we'd win hands down. Getting back to the point of the article, I don't support mandatory helmet laws as, after spending a lot of time researching bicycle helmets and helmet standards (or rather lack of standards) I came to the conclusion that there were more of a marketing gimmick meant to separate you from your money rather than a bonafide safety device. However, I can understand that some people want to wear them because it makes them feel safer - heck I wore one religiously for years myself. Now I rely on stopping at stop signs and red lights and just generally following the rules of the road smarter and more defensively to keep all of me, not just my head, intact. I think the current arrangement is fine. If you want to wear one, wear a helmet. If you don't want to wear one, don't wear a helmet. The important thing is to cycle more. Cycling with or without a helmet is only as subjectively safe as you perceive it to be. Reduced cycling rates after helmet laws are introduced are not correlated with the actual accident rates (if anything, if helmets reduce the rate at which people take up cycling, that means fewer cyclists, and arguably fewer accidents). Cycling rates have gone down in jurisdictions where helmets were made mandatory, but these have generally been places where cycling rates were already low: cycling's mode share in Australia and New Zealand is very small. The two pictures are not the whole story. The Netherlands has better bike infrastructure (separated from car traffic) than Belgium, therefore cycling is easier and safer and more popular, therefore helmets seem less necessary. 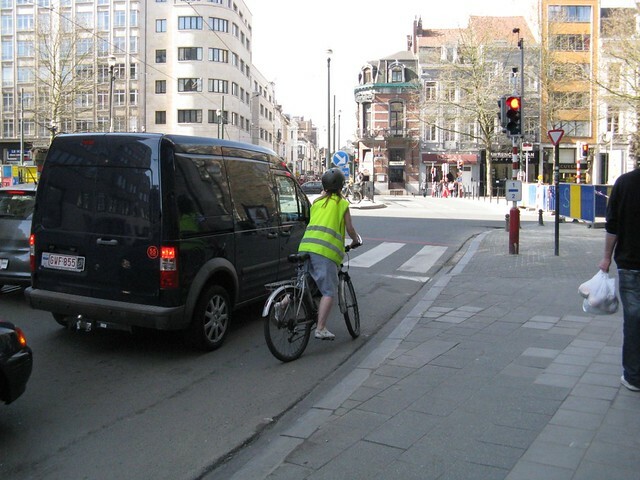 Belgium's bike infrastructure and bike culture is less developed, therefore less safe, therefore helmets make more sense in the absence of other protection. Helmetlessness is a sign of an established safe bike culture, but choosing to wear a helmet, or being required to wear one, doesn't conversely make biking objectively less safe. Nor does the safety of the helmet itself change in relation to the biking environment. It is impossible to overstate the protective value of helmets when the alternative is ZERO protective value. I'm not advocating mandatory helmets, but it seems like the objection to them is basically that it is a symbol/admission to drivers that cycling is supposedly unsafe; I'm not sure that going helmetless makes either drivers or cyclists more cautious and more aware any more than a helmet makes a cyclist more reckless or a driver more prone to assuming that a cyclist will be okay with less cautious driver behaviour. Wearing a helmet does not make you less safe nor does it actually prevent bike infrastructure from being installed. Mandatory helmet laws won't make cyclists less safe. If the author of this article was being honest they'd be able to recognize the difference between correlation and causality. They could sit down and think through the idea that correlations are not iron clad simple correlations. Perhaps even recognize blaming a helmet law for cyclist deaths is about as narrow minded as blaming mandatory Kevlar vest rules for solider fatalities. Toronto isn't Dutch never never land and I for one, like the coroner, don't have the feverishness to pave the way with my fellow cyclists bodies. Please put your damn helmet on and pay attention to the shitheads opening cab doors, the street car tracks and... well need I say more? Stay safe. Do you remember the moped? Do you remember the moped? When the moped (a low-powered motorcycle) was introduced, sales were going up... until the helmet and insurance rules were introduced. And sales of mopeds went down. Introduce helmet rules for everyone on bicycles is one way to kill bike sales and use. What really bothers me are the helmet gestapo. Sorry, but me not wearing a helmet doesn't effect you one bit. Health care costs? Lets try to lower then nearly $7billion spent annually on health care costs strictly related to illness and disease related to inactivity in this country. Also, head injuries aren't just a bike related issue. A pro-helmet person told me to tour a head trauma ward a few years back to see what happens. There were 11 people there at the time. 9 had head injuries from car accidents (motorists & passengers). 1 a pedestrian who was hit by a car, another from a failed suicide attempt. Not one cyclist. I can just see riding with a helmet in the winter now. I'd be in the hospital right away with frost bite to my ears...Toques don't fit will under a helmet. Also talking to some people in their 60's & 70's a little while ago, they said they'd be damned if after decades of riding a bike that they'd be forced to start wearing a helmet now. herb, ik hou van jou! It is fine to be against mandatory helmet laws. But I do not think it is wise to tell people that "Helmets also aren’t very effective in reducing injury damage to cyclists who are struck by cars". Common sense tells us that helmets save lives in a great many accidents. So do the Ontario data. As the report notes, cyclists dying of brain injuries were 3 times less likely to have worn a helmet than those dying of other causes. That implies that, if all these 129 cyclists who died had been wearing helmets at the time of the accident, about 30 of them would still be alive today. So: Bloggers should tell people to wear helmets. The government shouldn't make it mandatory. I too am against mandatory helmet laws, yet I wear one every day. There already is a mandatory helmet law for children. is your seat post and handle bars, bike length(cannot be) adjusted properly? most of my weight is even or dead set in the back so this would be pretty much impossible, I go through potholed roads all the time helmetless. This would probably be less likely to happen if your bike is properly fit. I agree and disagree Michael. I completely agree that the government shouldn't make it mandatory, however as a blogger I will never tell (or even suggest) that people should wear a helmet. -Alberta head injuries went up while cycling rates went down when their youth helmet law was introduced. -Saskatoon city council said no to a helmet law, saying more people riding bikes is better then fewer riding with helmets. -A few (unofficial) studies that show helmeted cyclists are passed closer. I tried this for a week and lost count of how many people brushed by me....In 8 years of riding without a helmet I've had one person pass closely. It is never easy to mandate common sense – especially where the government is concerned. I wear a helmet to ride to/from work. I figure if I am going to mix with rush hour traffic daily while riding faster than normal, then a helmet makes sense. By contrast, I certainly don't want to be forced to wear a helmet on short trips, or when I am riding at a slower pace. The manic and often unreasonable attitude some people have about riding without a helmet has the potential to take things too far and label cycling as a dangerous activity. When rules over-ride common sense, we surrender our right to choose, and our sense of empowerment; the trade off is a greater dependence on government to manage our affairs for us - and I'll have none of it! Changes should be made so that collisions with cyclists are prevented. Then you don't have to worry if the cyclist is wearing a helmet or not. The wearing of helmets only impacts the degree to which a cyclist is injured when they are hit. Helmets do not prevent collisions, making streets safer for all who use them does. How about the bike sharing, like Bixi? Will customers have to bring their own helmet? Will Bixi be supplying helmets (in a nearby locker?)? What if while the bikes are waiting, the helmets are stolen? Will Bixi have to tether helmets to each bike (shades of Nik Wallenda)? That's one way to kill bike sharing. Don't worry, the city doesn't have the resources to enforce any more cycling laws anyway. If they did, perhaps they'd get bikes off the sidewalks. Wait, no they wouldn't, because then they'd have to build bike lanes and trails for all the people they kicked off the sidewalks. I have been cycling for 67 years and do not wear a helmet. You might choose to wear one. Bicycles are the most efficient and versatile land vehicles on earth. Anybody who only drives a car or motorbike is not competent to talk about bicycles, cycling and cyclists. With any bicycle accident it can go either way. If you wear a helmet and have a serious crash you might survive and be paralyzed for the rest of your life. If you don't wear a helmet in the same situation you might be dead. What outcome is preferable for you or society as a whole? If you fall over a ditch a stick might pierce your brain through the ventilation slot of your helmet. Without a helmet it might have missed your head. It is all conjuncture. For every argument you present for wearing a helmet I can present an equally valid one against. Do you wear a helmet walking up- or downstairs in your home? It is more dangerous than cycling. Little kids are playing in the sandbox wearing bicycle helmets. I have seen family photo albums where the kids in every picture wear a piece of of plastic on their head. Helmet laws forcing every cyclist to wear a helmet are scams, justified and promoted by evoking people's fears and insecurities. That is why you pay 50 dollars for a piece of injection moulded plastic which costs 25 cents to produce. When and where will this nonsense stop? It is all conjuncture. For every argument you present for wearing a helmet I can present an equally valid one against. Fair enough. Someone could do a statistical analysis and actually determine which is safer. I'm not aware of any such study though. Would you wear a helmet if it had been shown to be safer for the style of riding you do? I suspect for most people who don't wear helmets the answer would be "it depends how much safer it is." I also suspect it wouldn't be safer enough to change most people's minds. I like to err on the side of caution though. I almost always wear a helmet.